Santiago Soliveres, member of MIES, together with scientists from the Rey Juan Carlos University, the National Institute of Agronomic Research in France (INRA) and theConsejo Superior de Investigaciones Científicas, has studied the many facets of the plant biodiversity of 123 arid and semi-arid ecosystems distributed throughout the planet. The results, which appear in an article published in the journal Proceedings of the National Academy of Sciences USA (PNAS), show the importance of the rare species and their evolutionary history to maintain soil fertility and productivity. In arid areas around the world. Last Friday 1/03/2019 UN has declared the decade 2021-2030, as the decade of ecological restoration. The University of Alicante has developed theoretical and applied research of first line in this discipline for more than two decades and has master and phD programs oriented to the same one, so that we are particularly pleasant this news. In addition, UA will organize the next European Restoration Congress (SERE September 2020). Hopefully it will serve to enhance the restoration in Spain and the world, and thus protect biodiversity, improve the provision of ecosystem services and quality of life, and step, improve the quality of restoration projects and consolidate this professional sector. The ecological bases for the Spanish Strategy for Green Infrastructure, Connectivity and Restoration have just been published. It has involved researchers from the Department of Ecology and IMEM Ramon Margalef, professors of the Master's Degree in Management and Restoration of the Natural Environment of the University of Alicante. University of Alicante Professor and member of MIES, Francis Mojica, receives an Honoris Causa Degree at the Menéndez Pelayo International University. Last 22nd of May we held the VII seminar of the Chair Aquae, which called the Research Awards chair Aquae 2018, which reward the best doctoral theses, TFMs and TFGs on economics of water. The work must have been defended within three years prior to this call and must be related to water in its economic and social environment, which may have been addressed from any discipline. The prize is endowed with €3,000 for the winning doctoral thesis and €1,500 for the runner-up, and with €1,000 for the GFR and TFM winners of the first prize and €500 for the prize winners. The deadline for submitting applications ends on July 15 in the case of doctoral theses and on 28 September for the GFR and TFM. Course which promotes the creation of green jobs and the reduction of the negative impact of traditional systems for the elimination of citrus crops. Coordinated by the Low Carbon Economy Foundation, the course is part of the EmpleaCitric project, co-financed by the European Social Fund through the Biodiversity Foundation. Nicholas José Talbot is a Full Professor of Molecular Genetics in the University of Exeter (United Kingdom). The investigation of the ProfesorTalbot centres in the vegetal illnesses. In concrete, he has contributed of significant form to our knowledge of the rice more important illness, called the "rice blast disease", caused by the fungus Magnaporthe oryzae. MIES members coorganize the 23rd European Nitrogen Cycle Meeting; will be held at Hotel Alicante Golf in San Juan (Alicante), Spain from 19-21st September 2018. This meeting will bring together an international group of researchers who share interests in Nitrogen cycle. Francis Mojica, a member of the MIES, receives the Albany award, the most prestigious medicine award in the United States. The microbiologist of the University of Alicante, member of MIES Ramon Margalef, Francisco Mojica, has been awarded in London with the Plus Alliance Award for Global Innovation for pioneering research that led to the development of the genetic editing technique Crisp-Cas9. PRESIDENT/To: Dr. D. CARLOS To. GRACIA ALONSO. Professor Title of University. University of Barcelona. Dpto. Ecology. SECRETARY/To: Dr. D. ALBERTO VILAGROSA CARMONA. Professor Associated. University of Alicante. Dpto. Ecology. VOWEL: Dr. DÑA. TERESA SOARES DAVID. Senior Researcher; Coordinator of Forestry Systems To the (INIAV). National institute of Investigaçao Agrária and Veterinária (INIAV). Forestry Systems. ACTING PRESIDENT/To: Dr. D. VICTORIANO-RAMÓN VALLEJO SHOD. Professor Title of University. University of Barcelona. Dpto. Vegetal biology. ACTING SECRETARY/To: Dr. DÑA. MARÍA JOSÉ LLEDÓ SOLBES. Professor Title of University. University of Alicante. Dpto. Ecology. ACTING VOWEL: Dr. DÑA. ANGELS GARCÍA MAYOR. Marie Sklodowska-Curie Postdoctoral Researcher. Institut Give Sciences of l'Evolution of Montpellier, Centre National of the Recherche Scientifique. Hydrologie. BBVA Foundation frontiers of knowledge for Francias Mojica award, category Biomedicine, conceded to Francis Mojica, researcher of the MIES, shared with Jennifer Doudna and Emmanuelle Charpentier. Juan Francisco Martínez Mojica, researcher of the IMEM, has been awarded with the prize Jaume I by his path and findings in the CRISPR system . 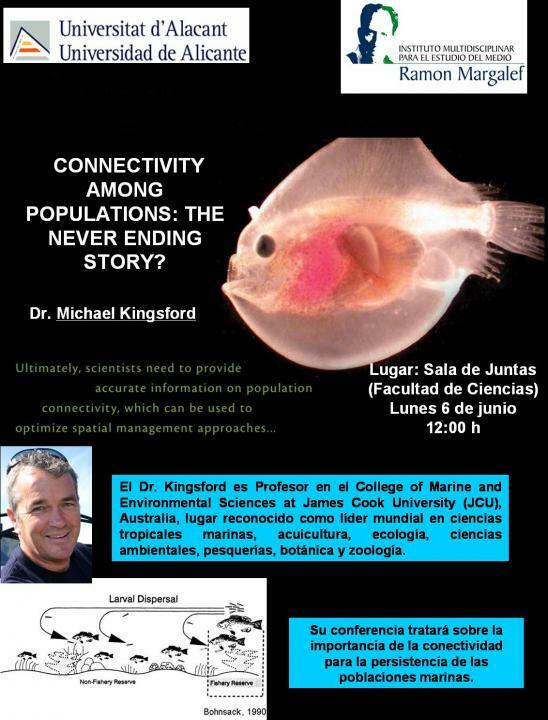 "Connectivity among populations: the never ending story", by Dr. Michael Kingsford. Dr. Kingsford is a Distinguished Professor at the College of Marine and Environmental Sciences at James Cook University (JCU), Australia. The College is a recognized world leader in tropical marine science, aquaculture, ecology, environmental sciences, fisheries, planning, plant sciences and zoology. His lecture will focus on the importance of connectivity between marine populations. Place: "Sala de Juntas" of the Faculty of Sciences. Monday, June 6, 12:00 h.
We are pleased to announce a new edition of the Days of diffusion of the institute InvestIMEM 5.0 that will take place next Tuesday 10 May. There will be two blocks of presentations in the morning and a block in the afternoon. The scientific program is attached, and we expect result you interesting to know the news in the research activities of the MIES, the lines of investigation that develop and interact in an amicable environment and distended with mates, professors and researchers. Even though, will exhibit posters of works of investigation realised by members of the MIES. Place of the Days: Room of Boards of the Faculty of Sciences. Taught Course from May 9 to 18 in the SSTT greenhouse of the University of Alicante. For more information visits the page of "Courses". The magazine Science has published an article in the consider to the System CRISPR, discovered by the microbiólogo of the IMEM, Juan Francisco Martínez Mojica, like the Scientific Advance of 2015. According to the prestigious publication, the international scientific community posits the finding and to his multiple applications to the Nobel prize. Researchers of the IMEM will collaborate in the I Ecuadorian Congress of Restoration of the Landscape CERP2016, together with the Technical University Particular of Loja, the Consortium for the Sustainable Development of the Ecorregión Andean and the Ministry of the Environment of Ecuador. The congress will take place in Loja, of the 5 to 9 April 2016. Agreement, in preparation, of scientific collaboration through the Institute and the Department of ecology of the University of Alicante with the Escuela Superior Politécnica de Chimborazo (Ecuador). Sergio Molina, researcher of the Institute, along with members of the research group of the au "Sismologia-riesgo seismic and processing of the signal in natural phenomena" and in cooperation with several Spanish universities and institutions in Haiti, has completed and published the first study of seismic risk for the major cities of Haiti (Port-au-Prince and Cap-Haïtien). Our researchers attend the V Spring Symposium on Forest Ecophysiology, in Isaba (Navarra), day 20 to May 22, 2015. The government knocked down in 2008, the project that inspired the Princess of Asturias prize in Dr. Francisco J. Martinez Mojica, researcher of MIES. Dr. Martinez Mojica was the first person that was fixed in some genetic fragments present in bacteria, important in its use in the human immune system. Panel discussion with people from different fields (cultural, experts, associations...), in order to discuss about the problems and opportunities of land plots abandoned, from a perspective of social and ecological restoration. of the natural environment that is it will produce next May 29 from 10 to 14 h.
Free registration to cover the number of places. The admission will take place in strict order of registration from 12 h of 18 may. We are pleased to announce a new edition of the diffusion day of the Institute InvestIMEM 4.0 that will take place the next day on March 31. There will be two blocks of presentations in the morning and in the afternoon. Attached you can find the scientific programme, which we hope find you it interesting to learn about new developments in the research activities of the MIES, develop lines of research and interact in a friendly and relaxed environment with peers, teachers and researchers. Also, posters of research work done by members of the Institute will be exhibited. It is very important that you send an email of confirmation of attendance simply responding to this email and putting in copy to imem@ua.es. Place of sessions: "Sala de Juntas" of the Sciences Faculty. Next Friday, February 27 will take place the defense of the thesis "Ecological restoration actions. Recovery of the Mediterranean ecosystem functional processes; subjected to disturbance" defended by Haroun Kribeche. Seminar "Ecological characteristics of the human species"
Rapporteur: Estanislao Luis Calabuig. Professor of ecology of the University of León. It took place at the UA day transfers 2015, 4th European forum for science, technology and innovation (11-12 February 2015 in Malaga) to inform the researchers groups about a business opportunity to find potential technology partners in the scientific field and the business sector. The IMEM research groups who are interested in attending the Forum (not assumes any expense for the Group), please contact the Secretariat of the IMEM or directly with the office of the OTRI. A great ECOLOGIST: RAMON MARGALEF (1919-2004) and its influence on the University of Alicante. Opening: Wednesday, November 19 at 13:00 o'clock, with the presence of professors of the Institute Ramon Margalef (MIES), the Dean of the Faculty of Sciences and the director of culture. Traveling exhibition by the Universitat de Barcelona. You can already consult the electoral calendar for the election of members not born that will form part of the Board of Institute. On the Bulletin Board next to the Secretariat of the Imem, provisional census is published. From October 28, check here census election final. The deadline for nominations of members not born will be open from 4 to 8 November 2014 (printed in the following link: http://web.ua.es/en/secretaria-gral/documentos.html#institutos). This course is aimed at students, researchers and professionals that require knowledge for the development of pilot projects. It is preferable that students have prior knowledge about statistical inference and basic computer. It is not necessary that students have prior knowledge in the statistical software R.
Researchers of the Interuniversity Institute of geography and of the MIES performed a study on floods, droughts and forest fires, which are detected as the main threats by natural phenomena in the population of the Mediterranean coast. The main objective of this is to promote dialogue of knowledge between research groups and the business sector on multidisciplinary issues of the environment. The activity will have the format of a round table involving a group of companies that have shown interest for the subject over the Permanent Commission of the IMEM and Professor Rosa Torres, an expert in communication, which act as moderator. COURSE "STRATEGIES AND TECHNIQUES OF EFFECTIVE AND EFFICIENT COMMUNICATION FOR RESEARCHERS"
Course that offers the opportunity to improve the different techniques of communication with the different stakeholders that can face in the world of research. The course is free and will be held on 20 and 21 February 2014, hours of morning in the ecology of the Faculty of Science II room, 1st floor, by Professor Rosa Torres. 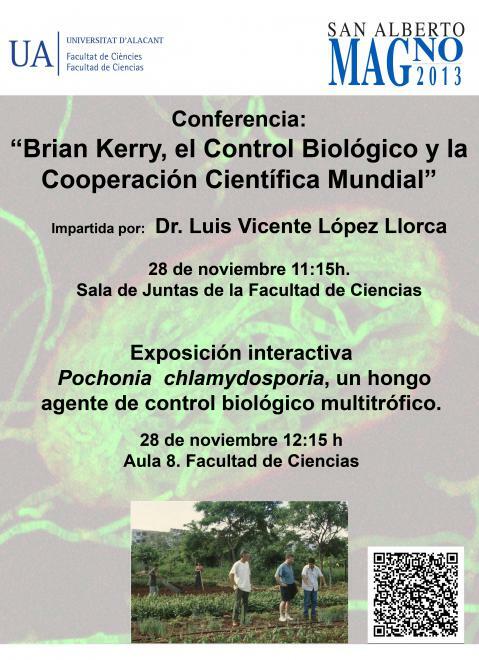 Homage to Professor Brian Kerry: Biological Control of nematodes phytopathogens. Francesca Abate, nurse, PhD student in "environment and health". Title of talk "that strips the sea always returns". Seminar of ecology. Phase 2 science. "How access to public technology transfer?" %u2026To"know" generated in our universities and research centres, 24 April at 17 h.
Today Wednesday january 9th the awards ceremony of the II Prize Jane Goodall of conservation biology and environmental ethics, will take place at 20 h. in the city of Alicante from the AU headquarters. The award-winning, Carmen Vidal, who develops its work in the Democratic Republic of the Congo, will give a lecture on his work, entitled "strategies for the conservation of biodiversity and sustainable development through education and training of communities: experiences in South Kivu (Democratic Republic of the Congo)"
CAMPAIGN "Speak for the Jungle"
-recycle useful items and properly dispose of toxic materials, avoiding the environmental pollution. -raising funds for education and conservation programs in Congo as the Recovery Center Chimpanzees Jane Goodall Institute in Tchimpounga. 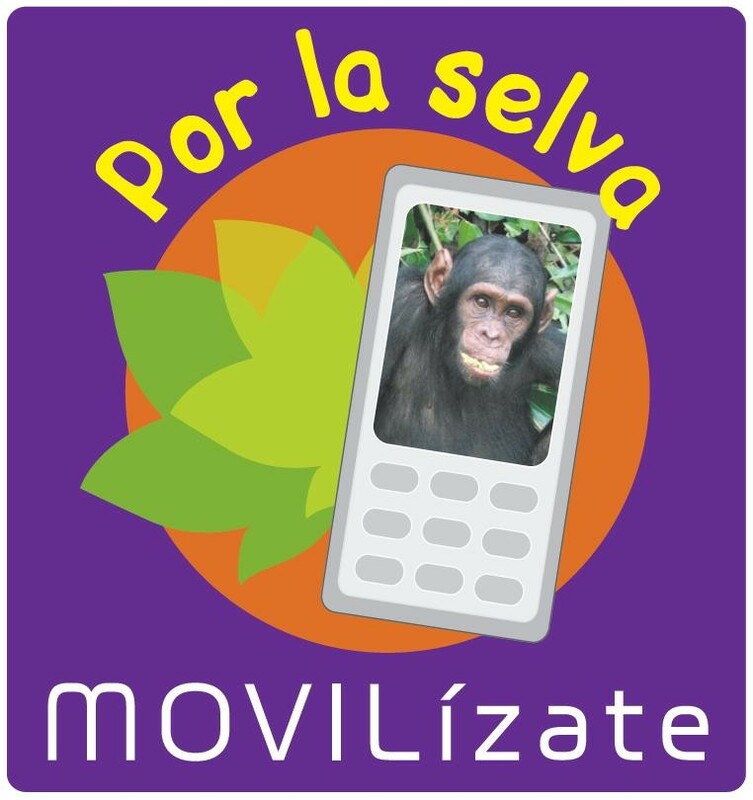 There are caring for chimpanzees rescued more than 140, and carry out sustainable development programs with the local community.